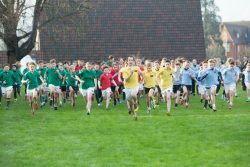 Cross country takes place in the Lent term. House cross country is a big event and every child is given the opportunity to run and thus represent their house. We also participate in a number of inter school competitions which see races of 120 children racing in each age group.